Each year, people around the globe observe the International Day of Peace on 21st September. This day was originally established in 1981 by the United Nations General Assembly. Then, in 2001, the General Assembly marked out this day as the day of non-violence and ceasefire. To mark this day, we have written a thorough guide on what is peace, what is the international day of peace, how do people celebrate this day and additionally a comparing script for the International Day of Peace to help you celebrate this day enthusiastically. For people from different lands and colors, the definition of the noble word Peace varies. As for me and maybe for most of the people out there, Peace means acceptance, harmony, and absence of hostility. As mentioned above, the International Day of Peace is celebrated on 21st September every year. This day is aimed to let men commit to peace above all the differences and variations. Additionally, to contribute to building a land of humanity, harmony, acceptance, and love for their fellow human beings. What is the 2019 Theme for the International Day of Peace? 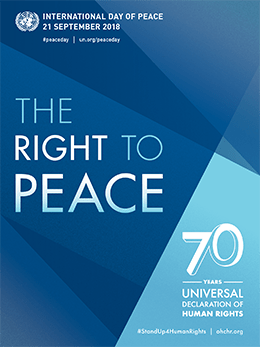 And for this year the theme for the International Day of Peace is The Right to Peace – The Universal Declaration of Human Rights at 70. How do People Observe the International Day of Peace? The International Day of Peace Provides a remarkable opportunity to people, organizations, and nations to engage in the acts of kindness, peace, love, and devotion to fellow beings. So, people across the globe undertake the message in various meaningful ways: from participating in peace marches, attending peace education events to observing a minute silence. Below I have written a comparing script for the Internationa Day of Peace which will aid in comparing an event held for the International Day of Peace to spread awareness, love, and peace. Good morning and a very warm welcome to one and all present here today for this noble occasion. It is me (name of the host) your host for today. we, initially, feel honored to roll down the red carpet to welcome our dignitaries, guests, parents, teachers, and dear students on this auspicious day to mark peace and kindness. 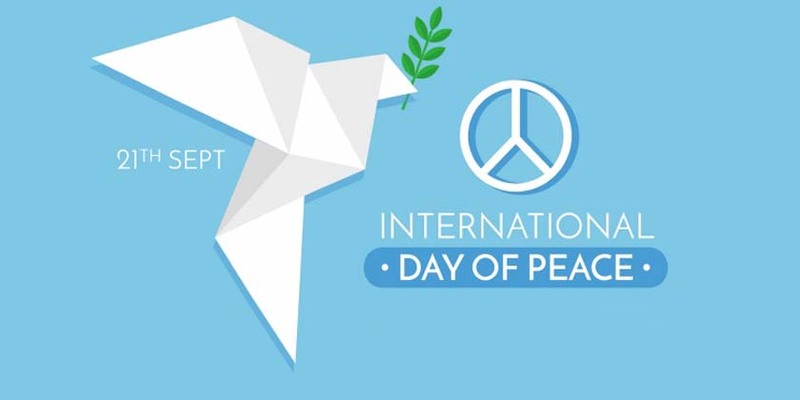 As we all know the International Day of Peace was established in 1981, then, the General Assembly marked this day out as the day of ceasefire and non-violence. From then on people from different color and background have celebrated this day in their ways to spread peace. So, we have gathered here to proffer our contribution in this kind act. (name of the choreographer). So, put your hands together for them. Splendid! We hope you enjoyed our angles energetic performance. If so, let us appreciate them for one more time. May I now request (name of the speaker) to be present on the stage for his speech on 2018 theme of the International Day of Peace which is The Right to Peace – The Universal Declaration of Human Rights at 70. “Everyone has the right to enjoy peace as we are created and set free by our Almighty Creator.” With that being said, it was (name of speaker). Thank you, (name of the speaker for sharing your view. At this moment we’d like to let you know that our students have prepared a drama on the 2018th Theme of the International Day of Peace. To call them on the stage, please give them a big round of applause. Wow, full of energy and lessons to take away! Therefore, they no doubt deserve applause so, please put your hands together for them. Now, here we have got some interesting question about the International Day of Peace to ask you. If you answered correctly, you will get some sort of prize. With that being said, we would like to wrap up today’s function and we hope you all had a great time. But before that, I would like to mention that it isn’t enough to talk about peace. We must believe in it and it isn’t enough to believe in it either. We must work for it. So, I hope you have found the article above helpful enough. If so, let us know in the comment below. Also, be sure to check out our article on Multitasking and All you need to Know about it.